Actually, thanks to my darling Sydney Swans succumbing to Fremantle in the AFL Preliminary Final, I’m not feeling all that chirpy. A bit heart-sore, in fact. It would have been so great to make the Grand Final again but my boys should be commended for the amazing effort they put in despite being decimated by injury. Never fear though, we’ll be back even better harder next year. Speaking of people who should be commended (oh, I kill myself with these segues! ), today on Friday Feast I’m thrilled to host my most excellent clever-trousers writing buddy Rachael Johns. Rach has shot to rural romance writing superstardom thanks to her brilliant books Jilted and Man Drought, and now she has a new one out. Outback Dreams is the first in a loosely related trilogy set in Bunyip Bay and believe me, it’s a cracker. Plus it has a bonus rural hunk on the cover. Should be more of it! Don’t you just LOVE a friends to lovers story? You can own your copy now with just a couple of clicks. Visit that most excellent Platinum ARRC sponsor Booktopia and buy away or try your local bookseller or chain store. You can also purchase Outback Dreams from Kobo. Amazon (for Kindle), Google Play, JB Hi-Fi and iTunes. Done? Excellent. Now get ready for some crunchy fun with Rachael. It’s so great to be back on my fab friend Cathryn’s AWESOME Friday Feast. I do feel like a bit of a fraud compared to some of the authors who come on here and offer really complicated gourmet recipes. I’m a simple girl at heart and lately that’s been transferring to my cooking. In fact, if I can get away with NOT cooking, I will. Maybe that’s cos my fussy kids have taken the joy out of it, but there is ONE thing I do enjoy doing in the kitchen and that is BAKING cookies and cakes! Like Faith, the heroine of my latest release, OUTBACK DREAMS, I am a comfort baker. If I’m in a bad mood or sad about something, there is nothing that can fix my emotions faster or better than baking a cake. In OUTBACK DREAMS Faith has a LOT to get grumpy about – mostly men, aren’t they always the problem? – and she does a LOT of baking. There are references to a number of slices, cakes and biscuits throughout the book but one thing that really gets the hero’s heart racing is her famous Custard and White Chocolate Cookies. ‘Damn straight,’ he replied, trying to ignore his body’s reaction to yet another physical interaction, which was all about her. Come on, she barely touched you. While Faith retrieved the snacks, Monty drummed his fingers on the steering wheel and brainstormed safe topics of conversation. He’d never had to think about such things with Faith before; come to think of it, he’d never had to with any woman. She returned moments later with a large Tupperware container and as she peeled back the lid, the familiar aroma filled the cab. He heard the roll of her eyes in her response. ‘The catering plans?’ She laughed. ‘It’s not all about the food you know. So, today, I’d like to share with you Faith’s incredibly easy but amazingly tasty recipe. The dough and the finished product are of equal brilliance and one batch will never be enough. Heat oven to 180C/160C fan. Line two baking trays with baking paper. Cream the butter and sugar in a bowel until light and fluffy – I use an electric mixer, cos who wants wooden spoon hand sprain? Add the lightly whisked egg and vanilla and mix well. Sift in the flour and custard powder and mix until a dough is formed. Throw in the choc chips and worked together by hand. Bake for 10-15 mins until golden. Remove and cool on a wire rack. 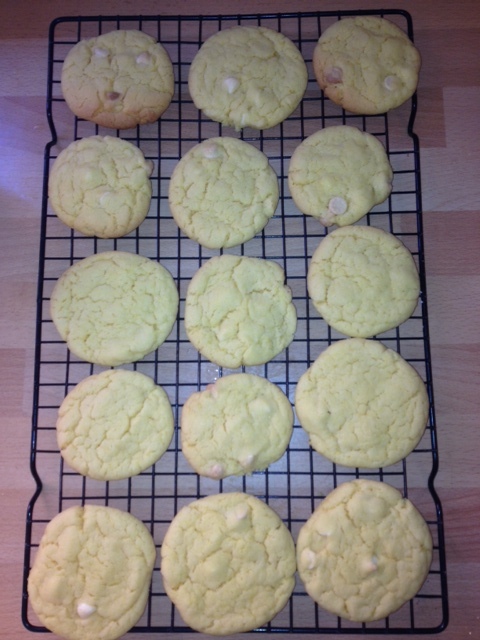 Try not to scoff the whole batch in one go! I hope some of you will have a go at this splendidly easy and delicious recipe!! In the meantime, do tell me what YOUR favourite cookie is! Thanks, Rach. Those biscuits (sorry, the Aussie snob in me can’t bring myself to call them cookies) sound completely delish. Just imagine, if I stuffed them with red Smarties, they’d be celebratory Sydney Swans biccies! Now listen-up, Feasters. Because Rachael is kind and generous and lovely, she’s offering a print copy of Outback Dreams to one lucky commenter. All you have to do is share your favourite biscuit and we’ll put you in the draw. Maybe you’re an ANZAC biscuit fiend. Perhaps Tim-Tams are your go. Or maybe you’re a secret Iced Vo-Vo connoisseur. Simply share your biccie (or cookie!) love and you could win. But get in fast. Giveaway closes midnight Tuesday, 1st October 2013 AEST. Open to Australian postal addresses only. If you’d like to learn more about Rachael and her books, please visit her website. You can also connect via Facebook and Twitter. This entry was posted in Friday Feast and tagged Australian romance authors, Australian Romance Readers Convention, Australian Writers, Baking, Biscuit recipes, book giveaway, Booktopia, Cathryn Hein, Chocolate recipes, Cookie recipes, Cooking, Custard and white chocolate cookies, Food, Friday Feast, giveaways, Google Play, iTunes, Jb Hi, Jilted, Kindle, Kobo, Man Drought, Outback Dreams, promo, Rachael Johns, Recipes, rural romance, Sydney Swans, white chocolate, white chocolate recipes on September 27, 2013 by cathrynhein.